*WINNER: 2017 Compton Crook Award! *WINNER: 2017 RT Booklovers Award (Science Fiction)! *A Wall Street Journal "Summer Reading: One expert. One book" pick for 2017! *The RT Book Reviews "June 2017: Seal of Excellence" pick! *A B&amp;N Sci Fi and Fantasy Blog "Best Science Fiction &amp; Fantasy Books of 2017 So Far" pick! *A Book Riot Best Books of 2017 Pick! *A Vulture "The 10 Best Fantasy Books of 2017" Pick! 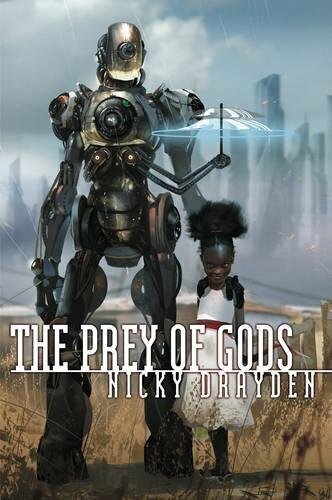 From a new voice in the tradition of Lauren Beukes, Ian McDonald, and Nnedi Okorafor comes The Prey of Gods, a fantastic, boundary-challenging tale, set in a South African locale both familiar and yet utterly new, which braids elements of science fiction, fantasy, horror, and dark humor. In South Africa, the future looks promising. Personal robots are making life easier for the working class. The government is harnessing renewable energy to provide infrastructure for the poor. And in the bustling coastal town of Port Elizabeth, the economy is booming thanks to the genetic engineering industry which has found a welcome home there. Yes—the days to come are looking very good for South Africans. That is, if they can survive the present challenges: A new hallucinogenic drug sweeping the country . . . An emerging AI uprising . . . And an ancient demigoddess hellbent on regaining her former status by preying on the blood and sweat (but mostly blood) of every human she encounters. It’s up to a young Zulu girl powerful enough to destroy her entire township, a queer teen plagued with the ability to control minds, a pop diva with serious daddy issues, and a politician with even more serious mommy issues to band together to ensure there’s a future left to worry about. Fun and fantastic, Nicky Drayden takes her brilliance as a short story writer and weaves together an elaborate tale that will capture your heart . . . even as one particular demigoddess threatens to rip it out.